I wanted to make Ms. Bathory a character that the audience could feel for, and the story she was featuring in was only 12 pages long, so I wanted her relationship to Timmy to be simple. 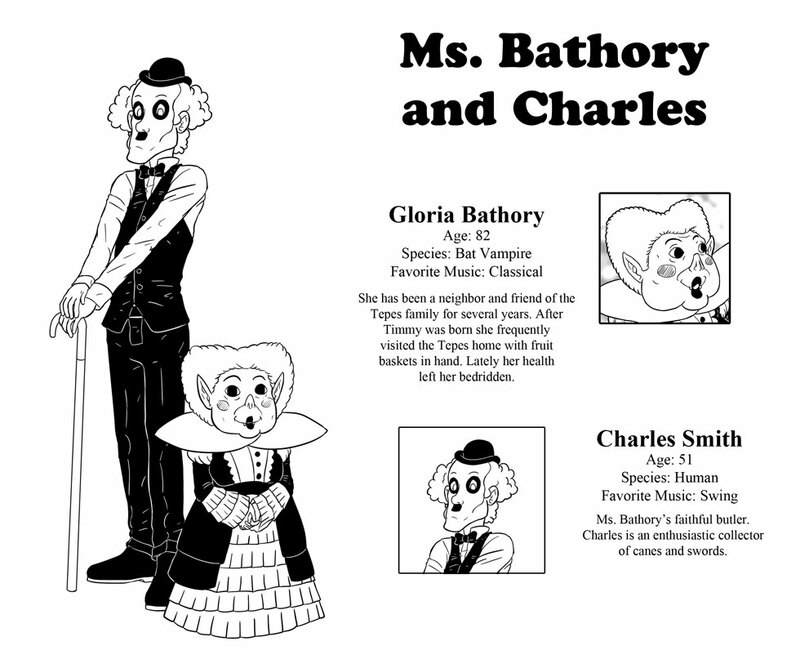 Since Timmy’s vision of Death was an important part of the story I decided to make Ms. Bathory a friendly neighbor rather than a family member to avoid too close of a connection that may have Timmy feel too much fear and sadness when Death appears later. I started with the image of a Honduran leaf bat. Ms. Bathory’s leaf like collar added a distinguishable silhouette, and was a modeled from Dracula in the 1992 movie, but with a puffy texture like the leaf bat’s fur. I had no real plan for him when I started working on the 24 Hour Comic’s Day tale, and he evolved as I quickly put the story together. Since the vampires of Transyltown don’t have many offensive powers, I liked the idea of their butlers doubling as bodyguards like how Laurence had become. I designed him straight on the pages of the story. When I thought, “He’s got a bit of a Charlie Chaplin thing going on here,” I just went for it and added the hat and cane and named him Charles.